I worked a few more stitch combinations today. 4.In the first row, chain stitch lines are bordering Up and down feather stitch and rimjim thread is used to lace this row. Wheat ear stitch is combined with up and down feather stitch in the second row. 5.First row is worked with Breton stitch and the second row has three stitches- up and down feather stitch, pistil stitch and buttonholed herringbone. I like this row. 6.In the first row the combination is with French knots and detached chain stitches. Up and down feather stitch row is embellished with Pekinese stitch and bullion knots are worked on the peaks. Unless I write down the detail of the last row, it may not be understood at a later date. I completed this stitch sampler with this last row. 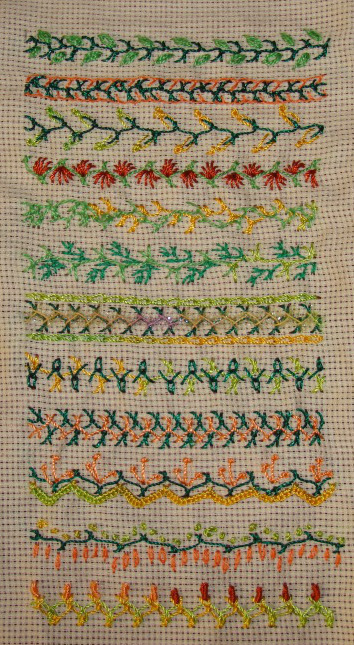 In this sampler, I couldn’t work many variations, but still tried some stitch combinations to make it more interesting. In this challenge, beads are used extensively to embellish these stitches by other TAST participants, I am still waiting to start. 1,The first row is worked with berry stitches and the second row with buttonhole stitch on both sides. 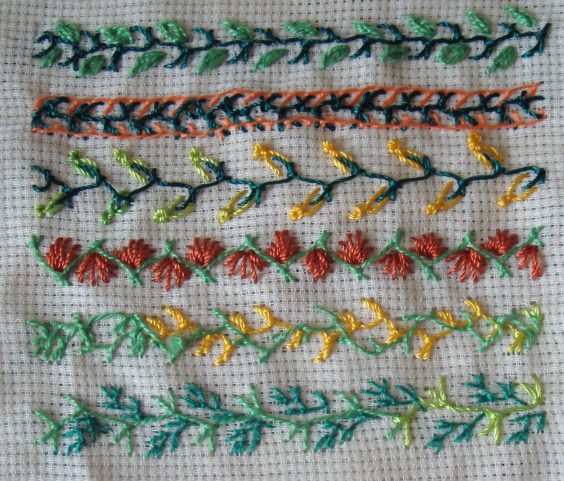 2,The first row is a combination with Italian border stitch and the second row is a combination with Algerian eye stitch variation. 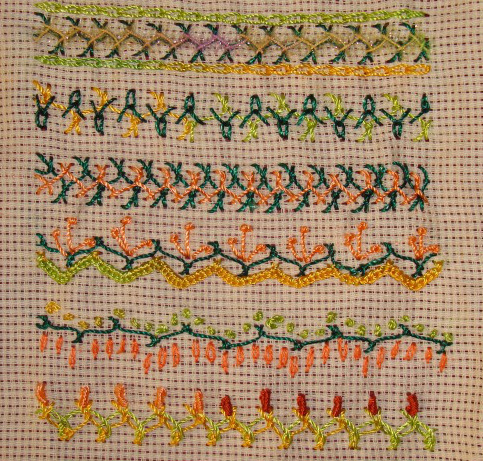 3.A line of feather stitch is worked over the up and down feather stitch in the first row, small up and down feather stitches are worked in dark green in the spaces of up and down feather stitch row in the second sample. Not very impressive though!